This CD was given away free with the British national newspaper, The Mail On Sunday. Comes in card sleeve. Companies/organisations mentioned on CD & sleeve: "Carbon Music & Entertainment", "The Brit Trust - Supporting Young People In Music And Education", "MCPS". Track 1: Universal Music Publishing Limited. ℗ 2009 Decca Records. Taken from the album "Faryl". Track 2: Fornaciari / Blue Mountain Music / Universal Music Publishing. Track 4: Ingman / Universal Music Publishing Limited / EMI United Partnership Limited. ℗ 2006 Decca Records. Taken from the album "Odyssey". Track 5: Boosey & Hawkes. ℗ 2007 The copyright in this sound recording is owned by EMI Records Ltd.
Taken from the album "Amour". Track 7: Universal Music Publishing / MCA Music. Track 9: Universal Music Publishing Limited. ℗ 2007 Decca Records. Taken from the album "Forever Vienna". Track 10: Universal Music Publishing Limited. ℗ 2007 Decca Records. Taken from the album "Spirit Of The Glen". Track 11: MCS Music Limited. ℗ 2008 Decca Records. Taken from the album "Only Men Aloud!". Track 12: Faber Music. ℗ 2010 Classic FM Ltd.
Taken from the album "Pelican In The Wilderness". Track 13: EMI Music Publishing / Universal Music Publishing / Chrysalis Music Group. Track 14: Bucks Music Group Limited. Track 15: Warner-Barham Music LLC. Adm. Universal / MCA Music Ltd. ℗ 2010 Production Team. The BRIT Trust has made a donation to the DEC for the inclusion of this track. All live tracks ℗ 2010 BRIT Awards Limited. © BRIT Awards Limited. 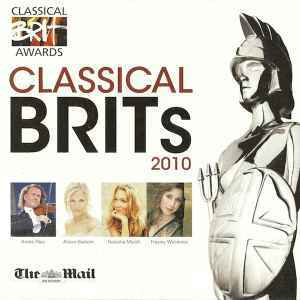 BRIT Awards Limited acknowledges EMI Records Limited, Sony Music UK Limited, Warner Music, Universal Music UK, and Classic FM for their support of the BRIT Trust in the production of this CD. For promotional use only - not for resale. Total playing time: 56:45 (including various padding seconds between tracks).